As delicious as iced coffee is, it can be difficult to get it right at home. Making a fresh pot of coffee and then letting it cool down can produce … old tasting coffee. Making cold brew coffee at home is a great idea and a favorite method of ours will probably be a future tip, but it’s time consuming and you need to make a lot at once. 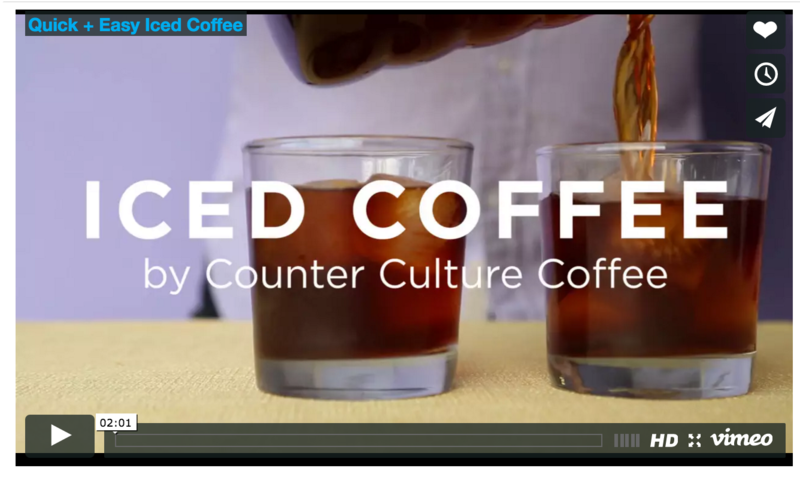 It turns out that if you’re already making pourover coffee at home, you can use this method, demonstrated by the fine folks at Counter Culture Coffee (Click here for a link to the video). The process works by measuring hot coffee and diluting it over a measured amount of ice. it produces a really nice cup that you can cool down and drink immediately - the holy grail of making iced coffee at home. Grab a fresh bag of lightly roasted beans, and you’ll have iced coffee that is delicate and flavorful. If you’re ordering online, try some from Counter Culture, or another one of our favorites, Heart Roasters.